The point of reference is Bansko, the biggest ski resort in Bulgaria. The drive from Sofia to Bansko is quite reasonable, mostly following E-79. From Bansko, follow the main road uphill (just left of a gondola lift), this road is quite winding as it gains elevation through the forest. Higher up, near some parking areas, keep right (follow signs for Vihren). 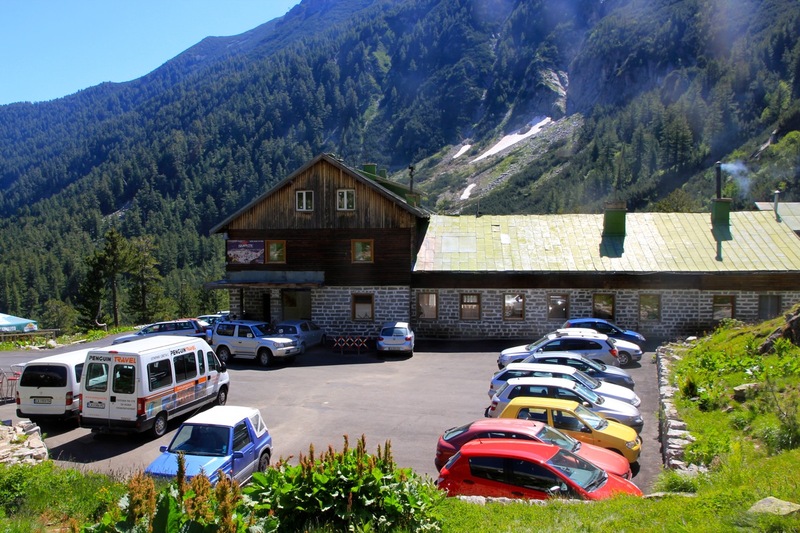 The road narrows, but keeps going until you arrive at the Vihren hut, a mountain hut at the end of the road. 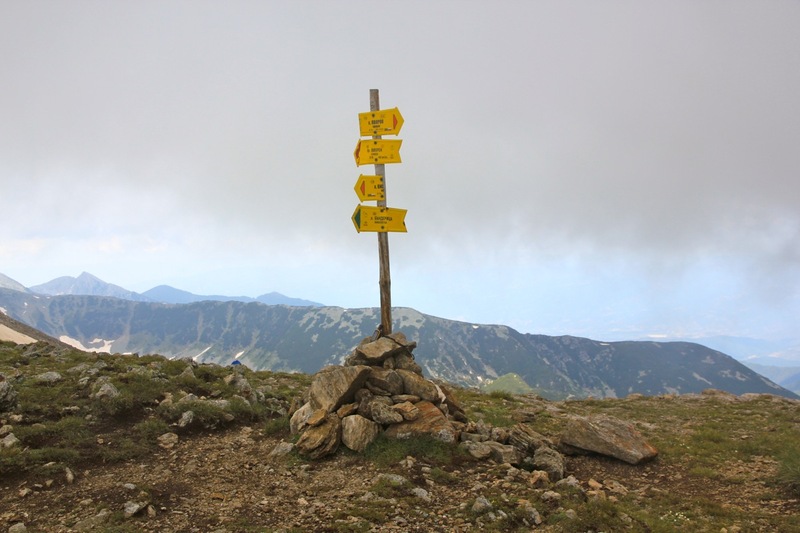 This is the trailhead, location N41.75681, E023.41614, elevation about 1980 m. From hotel Kempinski (right hand side, at the very upper part of Bansko), the distance along the road to Vihren hut is 14.4 kilometer. 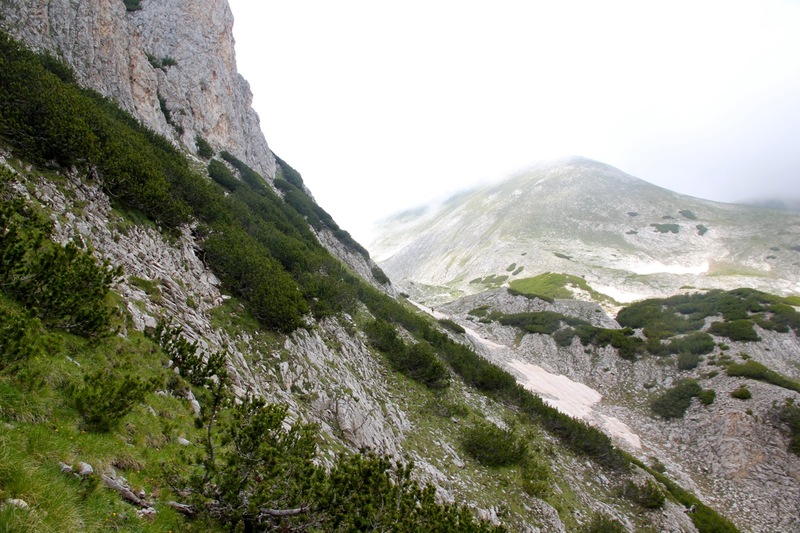 Note: This route is a very good option for climbing Vihren as well. Follow this route to the Premkata saddle. Then ascend Kutelo as an extra bonus, or just turn left and ascend Vihren. Descending Vihren can then be done as described on the Vihren page. 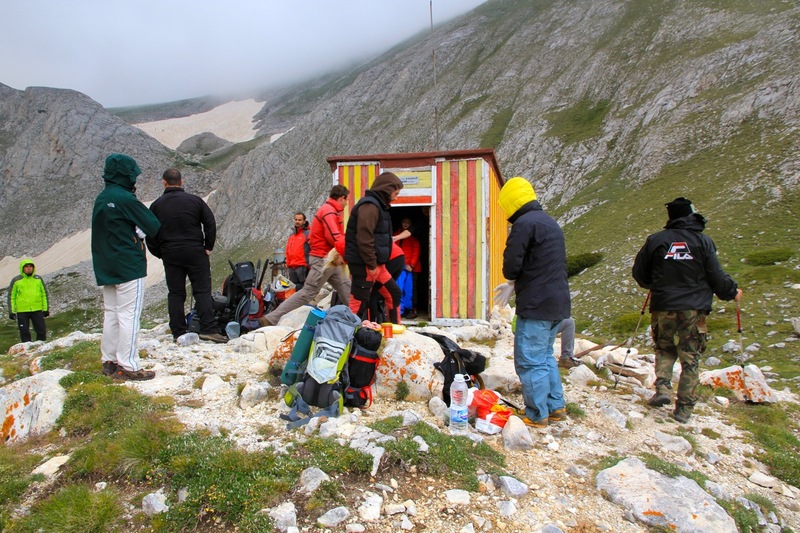 Start our from the Vihren hut along the route to Vihren. Immediately after crossing the creek, perhaps 15 minutes from the start, there is a trail fork with signs. The normal route to Vihren runs uphill (left) while the route to the Premkata saddle goes right. Continue along this nice trail as it winds its way slightly uphill and enters a basin. The trail climbs to the upper end of this basin then ascends more steeply to a ridge that separates the drainage from Premkata pass. There are two trails here, both work, I took the higher one. 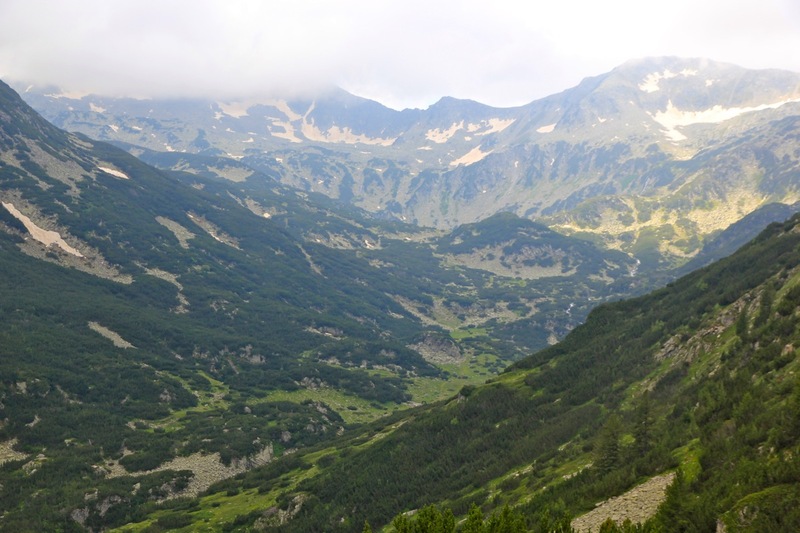 The route now traverses into the valley between Vihren and Kutelo. This is quite an impressive place, this side of Vihren is indeed very steep. 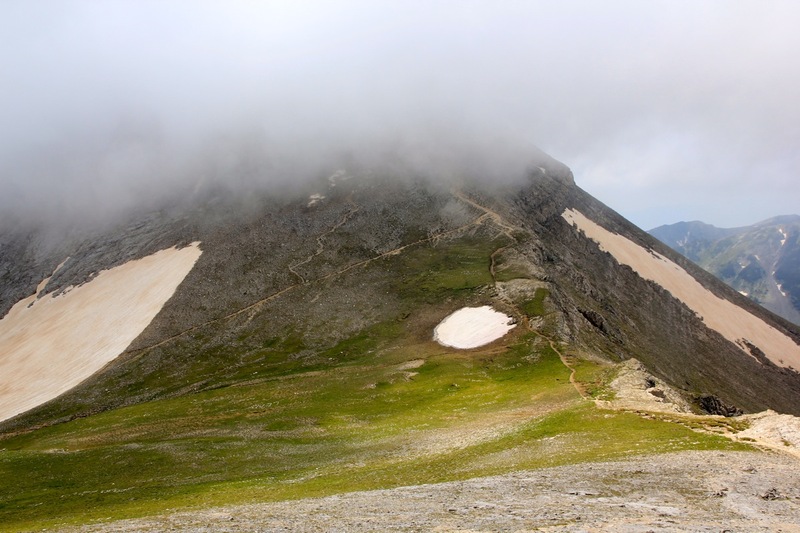 There is a small hut/shelter located on a small local hilltop to the right of the route, location N41.77100, E023.40824, elevation just slightly less than 2500 meter. 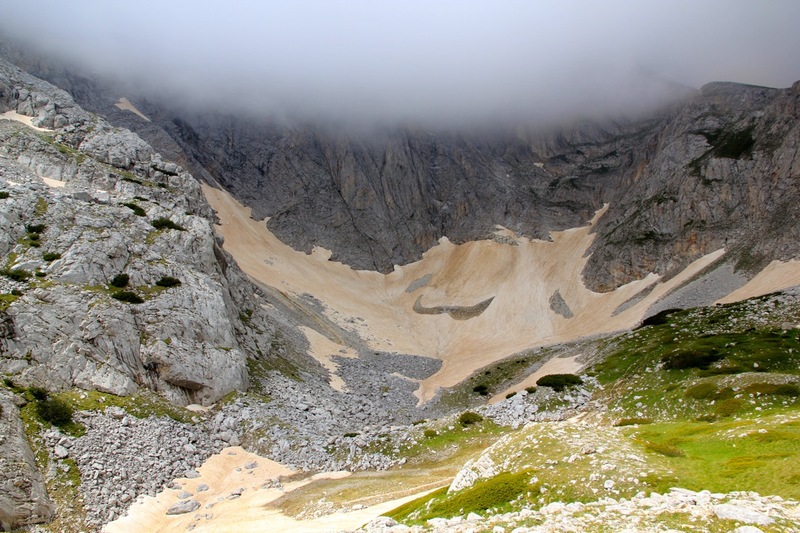 This area under the steep cliffs of Vihren, is called Kazanite. The route (well marked) continues up the main valley to reach the Premkata pass. 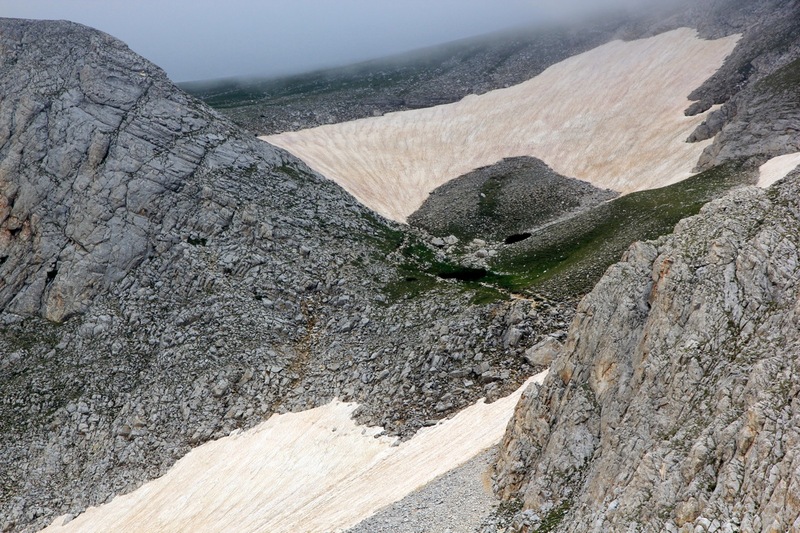 There is one slightly steeper section along the way and there may be some snow fields lasting well into summer. At Premkata pass, location N41.77175, E023.39659, elavtaion about 2610 meter, there is a signed trail fork. There are good views to the valley on the west side. 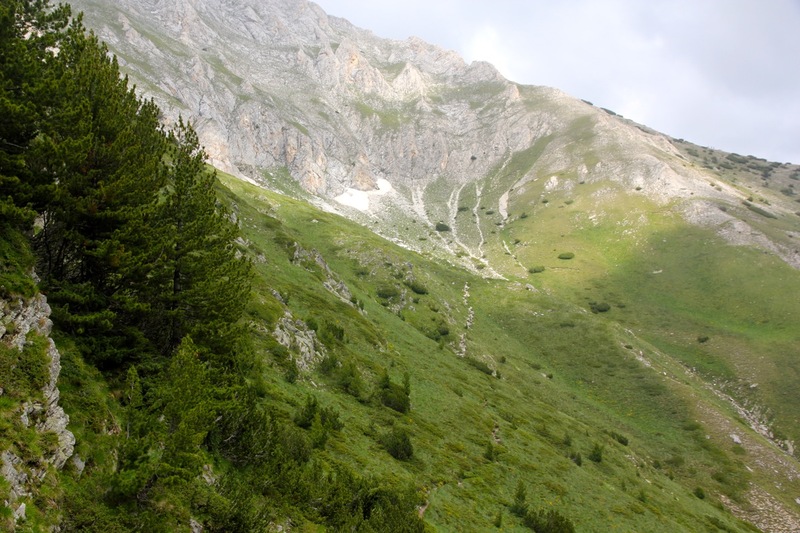 The route going left climbs Vihren peak. The route going right starts out on the ridge to Kutelo, however, the marked route traverses left while a climbers trail continues up the ridge. Follow this trail. 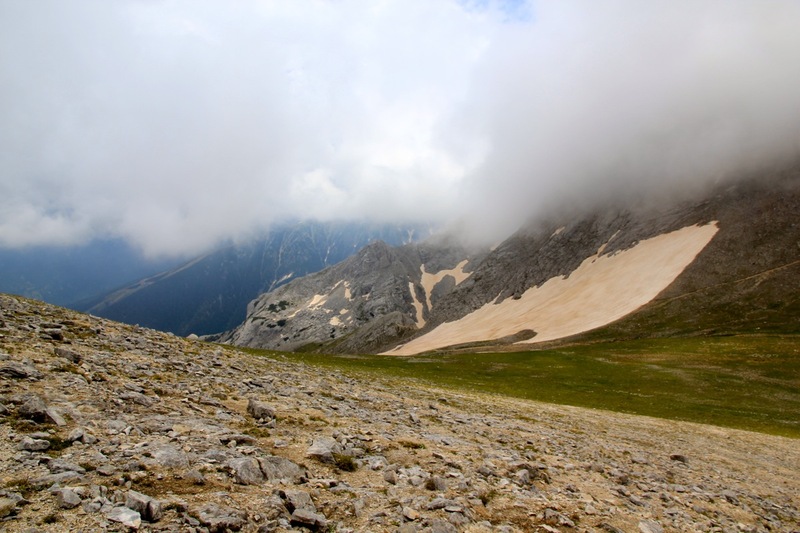 In the beginning there are several vague trails and the terrain is a mix of loose scree and rock. Higher up, the slope is slightly more gentle and the trail is now easy to follow as it zig-zags uphill along the ridge. 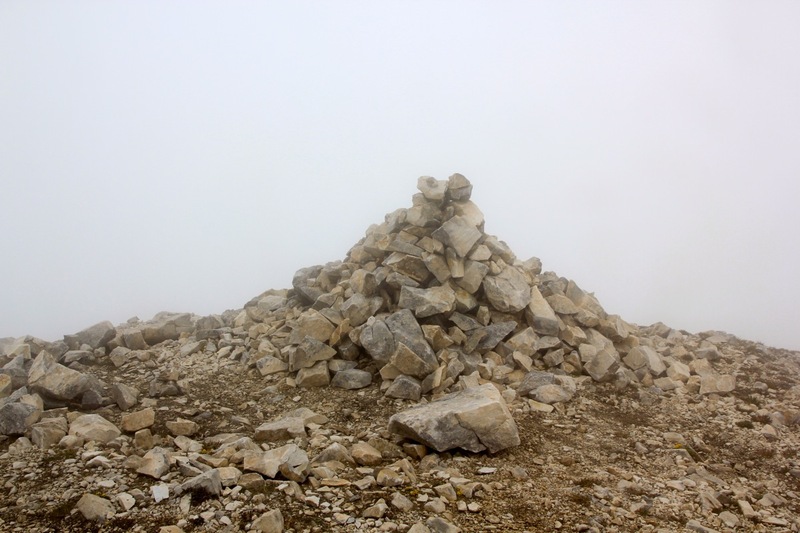 There is a short summit ridge (going right) and some sort of cairn (more a heap of rocks) that marks the summit. One may traverse the summit ridge in the oppsite direction (left) to reach a point called Kutelo II, only one meter lower. 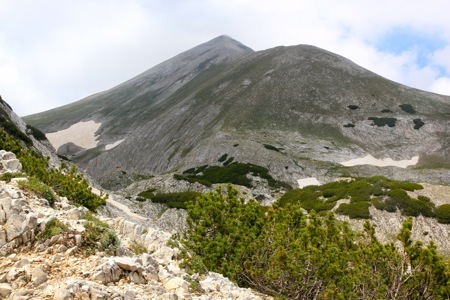 This was our last day in Bansko and it felt ok to make a short and easy ascent. I started out from the Vihren hut at 1030 and arrived at the Premkata pass at 1200. 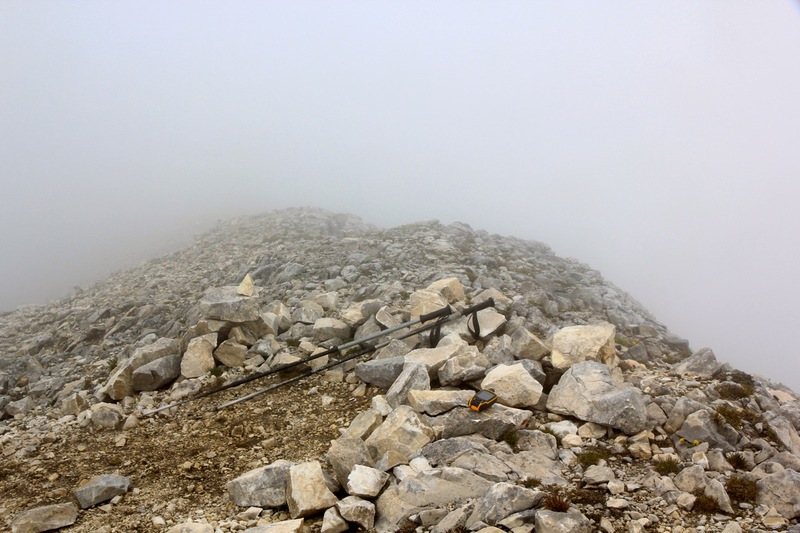 The summit was reached at 1230. Unfortunately, the clouds obstructed what would have been a fine view. I could see the sun directly overhead. Leaving at 1245, I was back at my car by 1415, so 1:30 for the descent. Here is a brief summary of the peaks climbed on this trip. 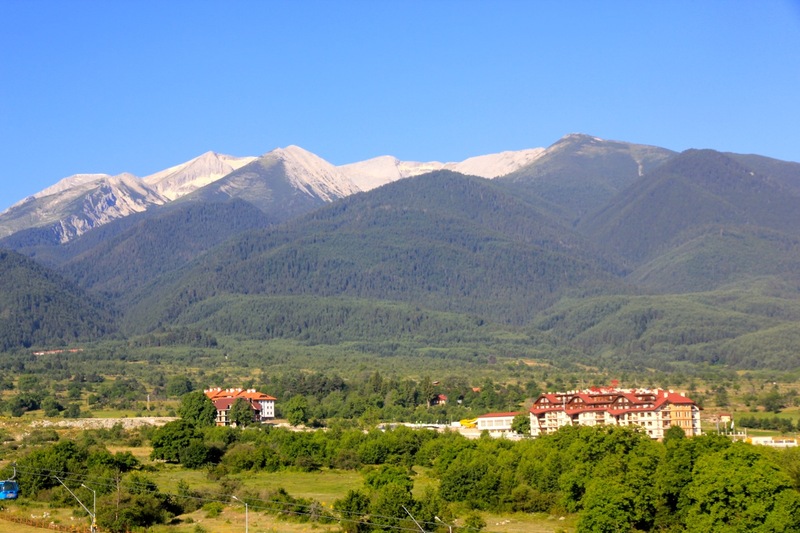 Kutelo as seen from our hotel in Bansko. The summit is just right of the snow, that is number two when counting fromm the left side. The valley that continues past the Vihren hut. The Premkata saddle as seen when descending from Kutelo. 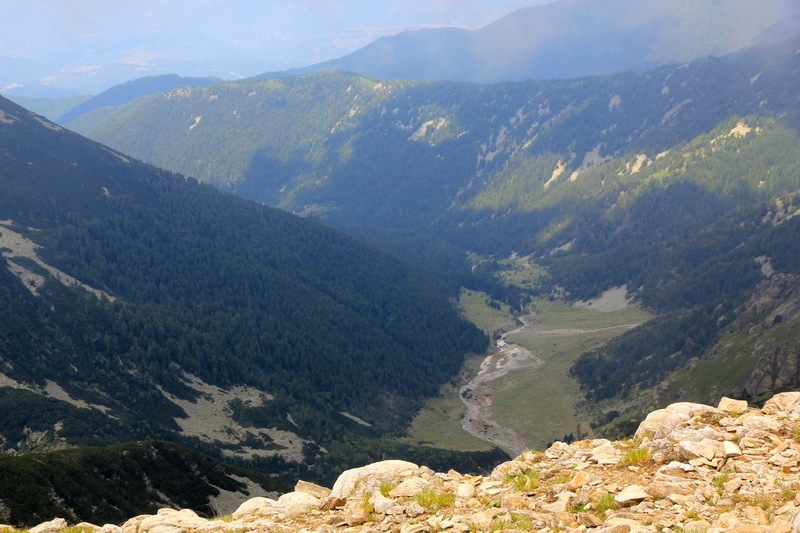 The upper part of the valley between Vihren and Kutelo.